Blue Belts and Car woes. 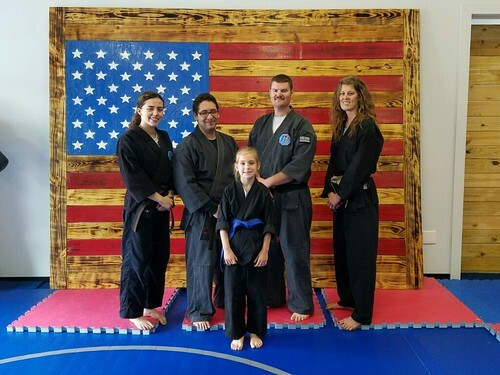 On April 22 Ella Kate tested for her blue belt, and got it! 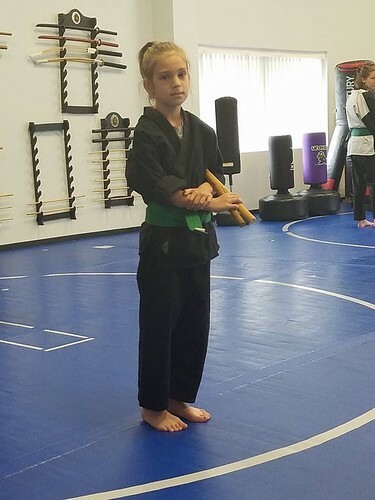 After a two hour long test, her blue belt was wrapped up around her waist. She is so proud of herself as we are too. So she is officially halfway to black. She also has to teach 40 hours before her next belt test. So she is teaching Addison’s class on Tuesdays and Wednesdays. 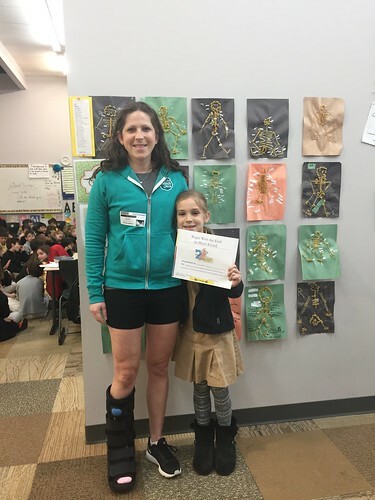 Addison also received a 7 Habbit Award at her school late April. 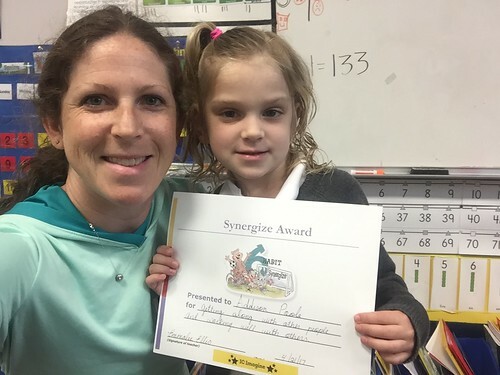 She was chosen for Synergize. She gets along with everyone and adapts to every situation easily. The teacher sent her notice home Thursday, so I was semi surprised that she actually got one! So go girl!! 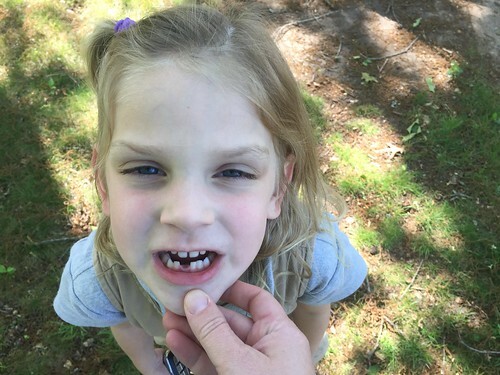 Addison also lost her first tooth last week! It was wiggly for maybe 2 weeks and then last week it was just dangling. I asked if she wanted me to try and pull it out and she said no. I was relieved, teeth pulling grosses me out. Michael is usually in charge of ripping, slapping, pulling teeth out. But, he was out of town. I told her it was going to fall out today or the next and as soon as she got in the car she announced she pulled it out. 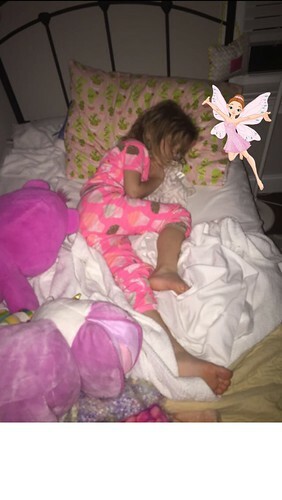 So she got a visit from the tooth fairy! 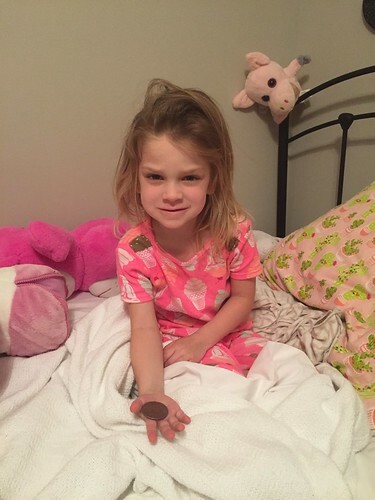 She got a silver dollar! 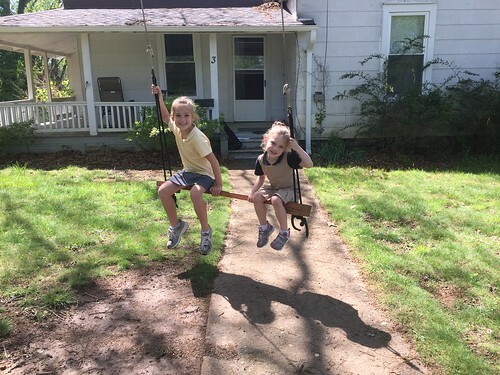 Swinging while waiting on violin lessons to start. 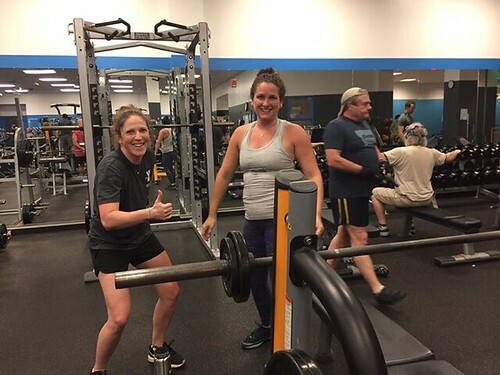 My friend Nikki and I lifting weights after our TRX class last week! Chris and Erica and their kids came to visit us last weekend. 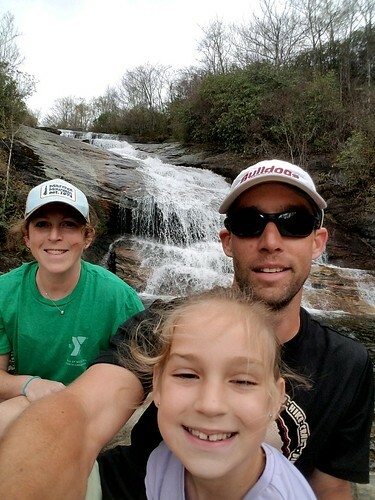 We took them hiking at Graveyard Fields so they could see a big waterfall. The weather was a tad bit chilly!! But the sun finally came out and the girls got to play in the water! 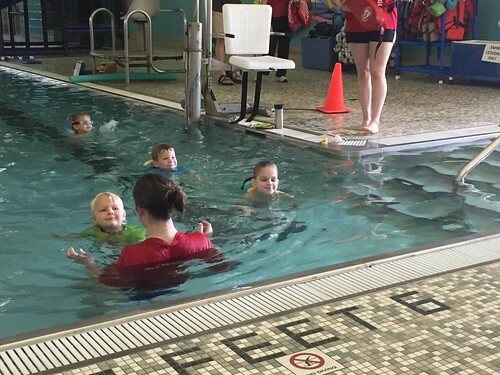 Addison has also started swimming lessons again, she seems to be a bit more confident than ever. She was proud of herself for swimming with this little back float. If she could figure out how to block her nose off when she holds her breath she would be fine. But she doesn’t have that down yet. So she gets water in her nose and gets a little disgruntled. But at least she is going under! I have been in a rental for a week now. My van was parked at karate and the owners wife who is from India is learning to drive. 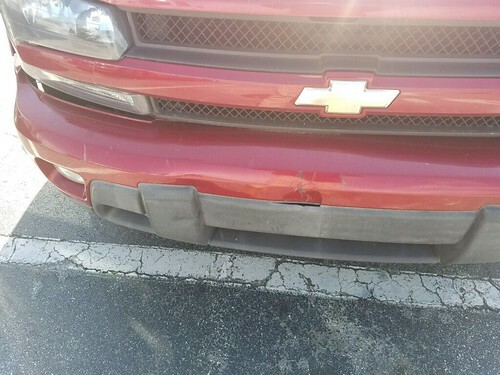 Well she went to park and hit my car down the left bumper and sliding door. I should be picking it back up today, I hope! 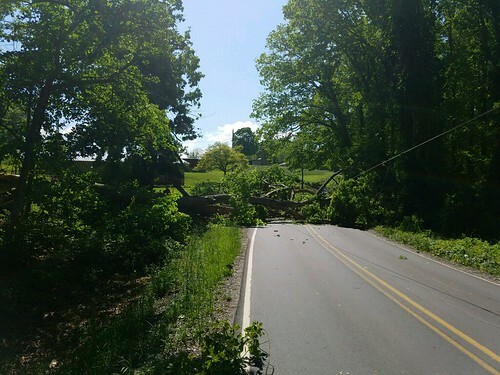 This weekend Michael left to go to Lowes, the back way which keeps us off the interstate and is faster, and he heard a tree snap and start to move. 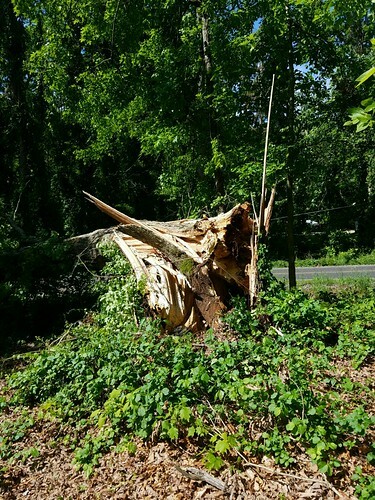 He slammed on the breaks and hit the tree with his bumper and limbs and power lines fell across the hood. It freaked him out. Had I not annoyed him with a long hug and had Bruce not been pulling out of his driveway, we might have had a different story. It was a huge 3′ diameter white oak. I drove by after swim lessons and the road was blocked off with fire trucks and power companies. He is glad he wasn’t messing with the radio or distracted and heard the pop. So I have to get the ball rolling on that car now! We have had a ton of rain, our rain gauge said 12″ in a week. Its been insanely windy outside as well. The wind blew that big tree over! Coming up next…Michael’s next big race in less than two weeks!! We have had a busy busy Spring so far. Check out my instagram account to see what we have been up to. 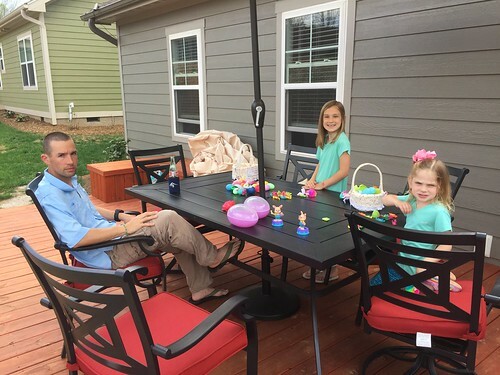 We had a great Easter even though we weren’t able to go to Memphis to be with family. The girls had a two week long spring break and spent the majority of it with my parents. 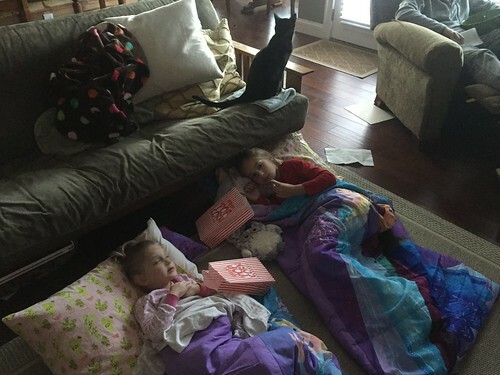 They went to the zoo, saw Beauty and the Beast, went to a trampoline park and visited with cousins and grandparents. We missed them! Michael got in his qualifying race for Western States this year. 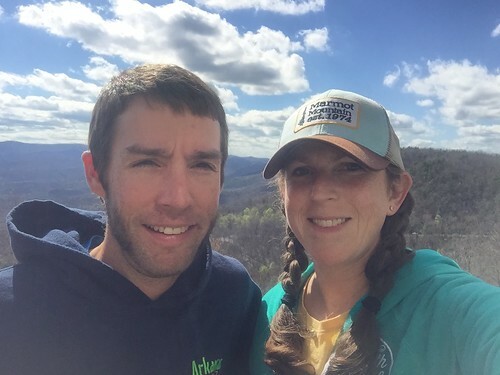 While the girls were in Memphis, we headed to the North Georgia Mountains where he ran a 74 mile race, the Georgia Death Race. This was his second time running it. He had a stress fracture flare (old injury) that made him taper earlier than he wanted to. He was able to finish the race in 18:18 and his leg didn’t bother him too much. He is currently “resting” the leg as we have a Hark Rock qualifying race coming up May 19, 106 mile in the same mountains in Georgia. I think we are both a little nervous about it. 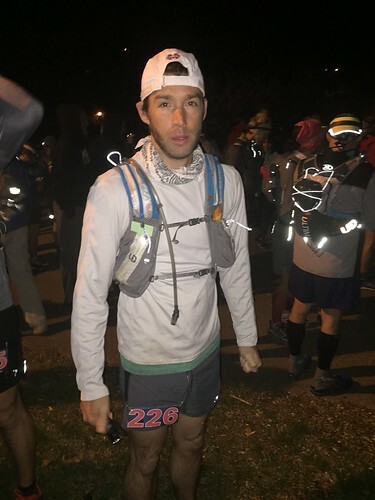 It’s twice the climbing of the Georgia Death Race and 30 miles longer. 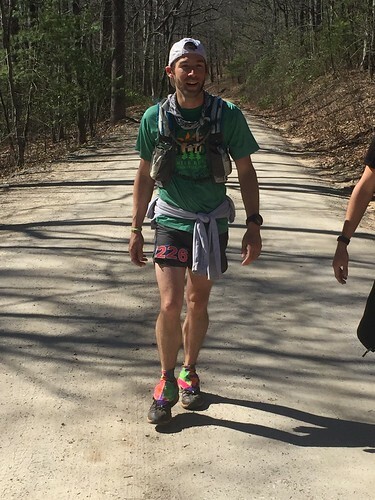 Cut off is at 48 hours…he is hoping to finish under 40…this will be one of the hardest races he has ever toed. So send good thoughts his way! And mine, that is going to be a tough weekend and race for both of us! Addison is picking up on reading, finally. 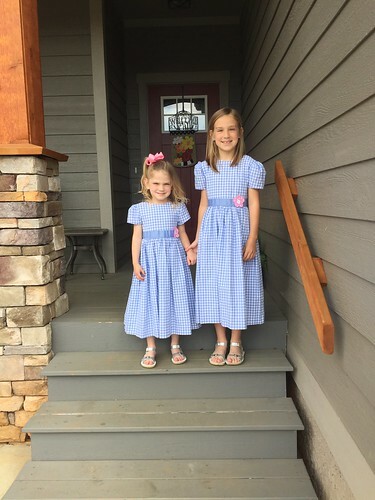 I am still not sure if she will move on to first grade or not. I just don’t want her to get behind. We have 11 weeks of school left and parent conferences coming up in a month of so. She is now a yellow belt in karate. Ella Kate is doing well, she is getting very good at playing her violin. She picks up songs so quickly now! 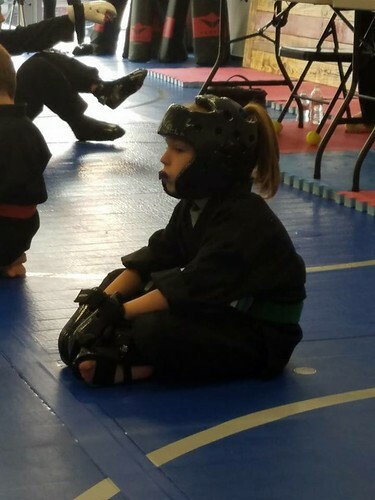 She has a big belt test this Saturday, blue belt. 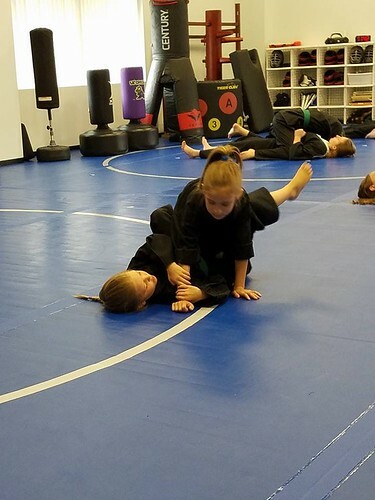 She is halfway to a black belt. She will have to step it up a notch on her sparring. I was watching the intermediate class, and they are a little more fierce when it comes to fighting. I can’t believe she is going into 4th grade in the fall! Michael started a new job three weeks ago. He is in training to become Operations Manager at K2. 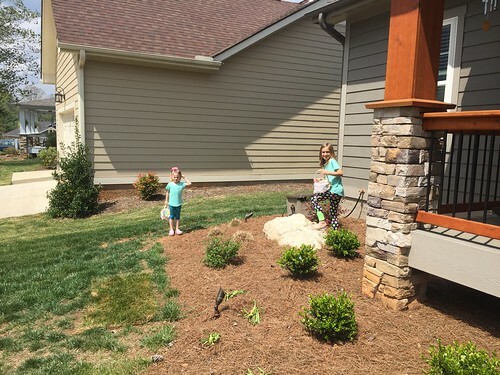 K2 is the largest irrigation company in Asheville, and they travel all over WNC. Last week he spent the entire week at Grandfather Mountain, installing irrigation at a golf course. He is suppose to be gone the next 2 weeks, but he is here today and tomorrow as it is suppose to rain up there. He has to work on a crew for a month. They want him to know how they install etc. So he is doing some physical labor! He likes it so far and said the owner is very down to earth. Michael had been unhappy at Snow Creek as they have some serious management problems. I had been looking for jobs for I don’t know how long (for him) but he never applied to any of them, so I quit. K2 actually sought him out and offered him a job. He has to take an irrigation contractor test in July. As for me, same ole same. Got out of my boot from my stress fracture and have slowly returned into jumping and some jogging. 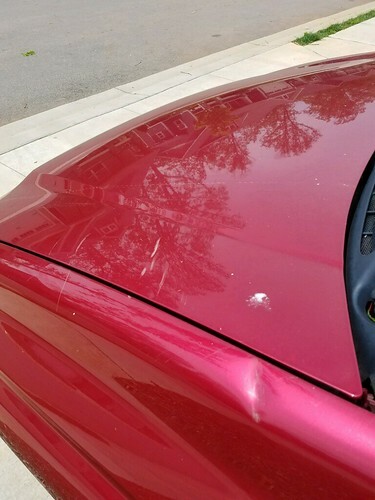 It rained the other day and I could feel the injury, other than that, I haven’t noticed it. Just keeping up with the girls, the house, yard, and the gym! I have drawn a few plans this spring as well. When we are here on the first Saturday of every month, we have been volunteering at our church to feed the needy. 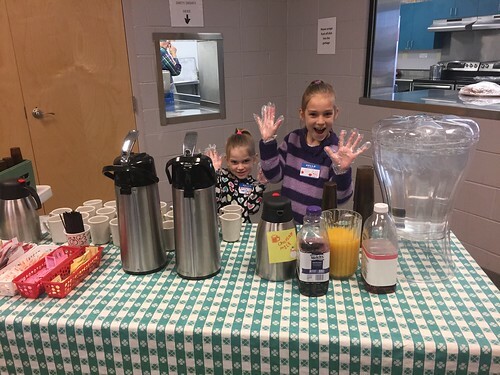 The girls really enjoy helping with the drink station. We missed April because of the Death Race. One of our new years resolutions is to volunteer as a family. 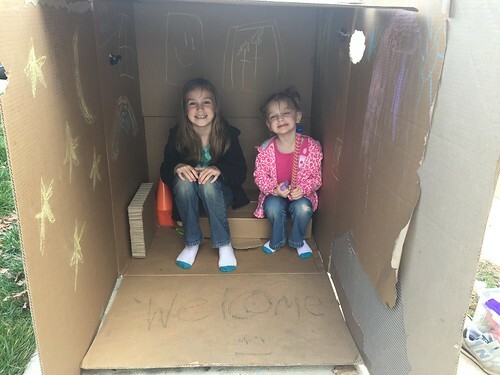 We finally got some patio furniture for the deck and the girls lived in the huge boxes for about two weeks straight! Ella Kate won an award at her school. They practice the seven daily habits and she got one for Beginning with the End in Mind. 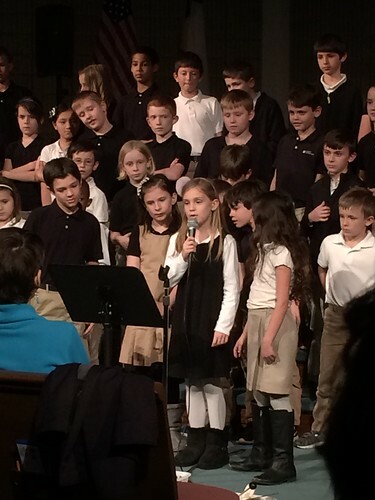 She also had a speaking part for their Martin Luther Jr musical. Amicalola Falls State Park, the beginning of the Appalachian Trail and the finish line for the Georgia Death Race. 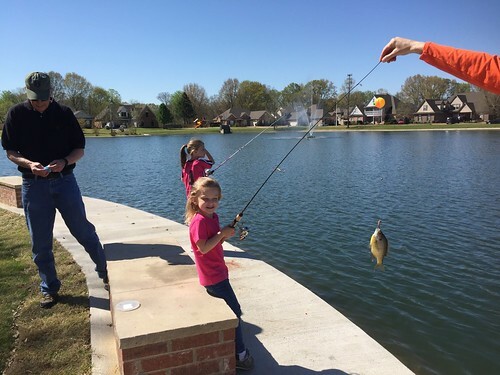 Girls fishing with Papa, Mimi, Aunt Holly, and AC! Addison caught one! We have had a crazy spring! 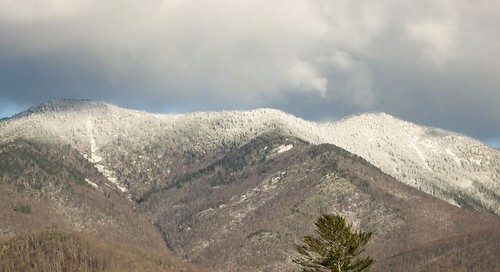 A few weeks ago we had another cold snap and the mountain peaks were covered. We only got a little sleet at 2300′! Since then it has been warm and sunny…and once again, we need rain. We still have wildfires going on around us. 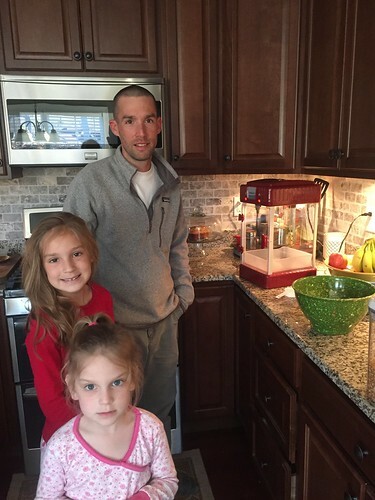 Several weeks ago I got a popcorn maker from Aldis and we finally busted it out! We want to get a projector for the deck so we can have movie nights outside! Everyone was excited for it, especially Michael! He loves popcorn! This was last weekend. 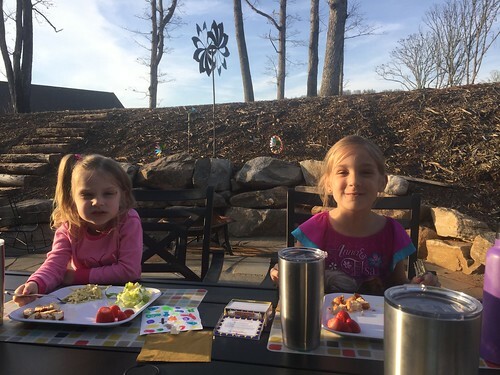 Since we got the table and chairs for the deck, we eat outside all the time. 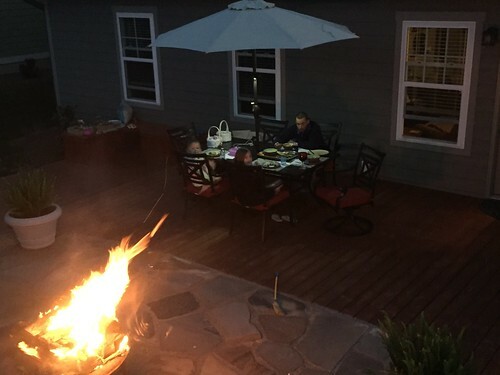 We had a fire and some steaks Saturday night. 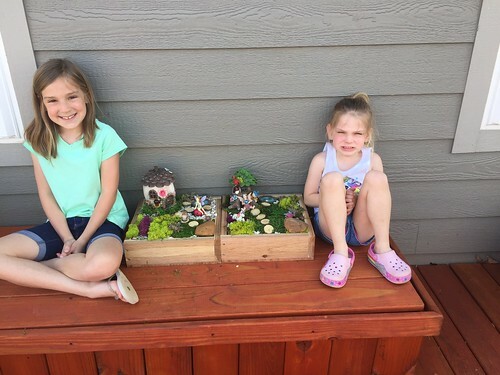 Mimi and Papa made fairy garden boxes for the girls for Easter. 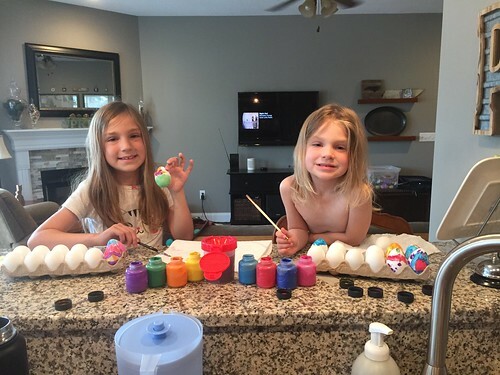 They got them some stuff to play and decorate with…they have been a huge hit! For the past two weeks or so I have had wrist pain, right wrist. It started out with a tingle, sometimes numb feeling. My ring finger and index finger would sometimes fall asleep randomly. Yesterday I figured it out. I have agitated yet another old injury. After taking almost a week off of anything involving landing on a wrist it went away. Yesterday I went back to PIYO which involves putting weight on wrists and tricep pushups, all was fine, just wouldn’t put as much weight on my wrists and more in my legs. I use PIYO as more of a stretching/flexibility class than anything. On Thursdays I do back to back with athletic conditioning and PIYO and I felt it. I knew exactly what it was. I am 100% certain I aggravated it while doing burpees a few weeks ago. Yesterday we did many exercises while in a plank and I could feel it just like I did when I was a cheerleader and gymnast. I never did have any broken bones while I was a gymnast. I saved all that for cheer-leading. I just knew that I had weak wrists and ankles like the majority of gymnast do, which is why you see them taped up from almost head to toe. When I reached 7th grade, my coach and I came to the conclusion that I had “peaked” and was basically too tall to really pursue a gymnastic career. At 5’6″ that is super model height for gymnastics. So I saw a flyer in middle school for cheer-leading tryouts and took interest in it. I talked to my mom about it and she said I could try out. 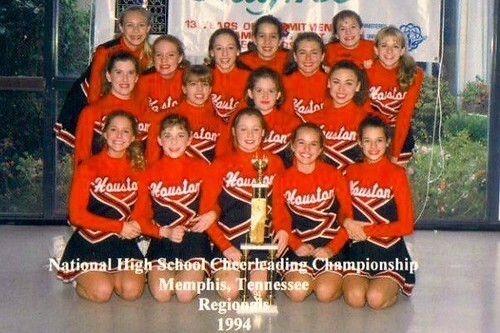 I had never been a cheerleader before except for peewee football and that was a joke. This cheer-leading wasn’t so much a joke. They stunted, tumbled, danced, and competed…and won national championships. They had tryout clinics and taught the same cheer and dance to everyone for the big day. I had no knowledge of all these motions and their names but learned it quickly. When it came time to tryout I tried my best…and then it came time to show tumbling ability, and that right there is the whole reason I made the squad. I had always been a power house tumbler. 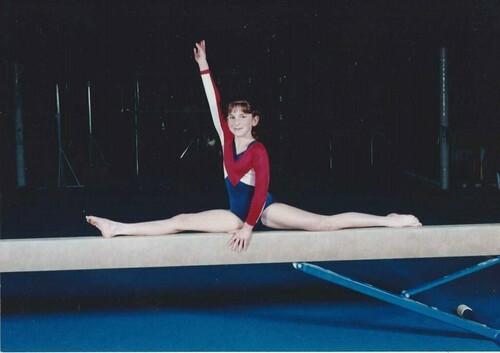 Floor was my favorite in gymnastics, having the power to twist and turn in the air has always been a rush for me. So began my cheer-leading career. After making the squad I also learned that I was one of the smallest and would be on top of pyramids, people, and flung high up in the air! I was a cheerleader from 7th-11th grade. Along the way I had 13 casts on my wrist and ankle. My doctor finally told me that I needed to “retire” otherwise I would be in a wheel chair in my old age. My file was about an inch thick. So after that conversation and getting into a fight with my coach about going to a concert for my birthday instead of a practice, I quit. One of my scariest injuries was a basket toss gone bad. I dreamed about it last night. I think the dream was triggered by my wrist woes over the past week. We recorded our practices so we could review and see what we needed to improve on. 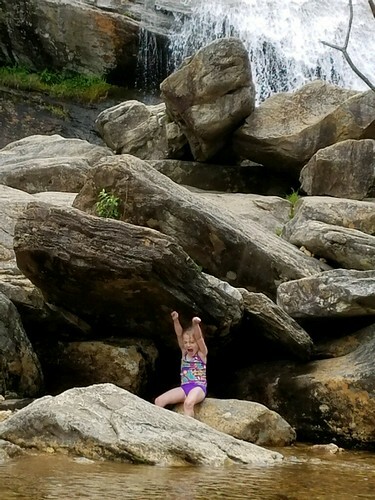 When we did our basket toss I was thrown up and out, instead of straight up…I landed on solid concrete, directly on my wrist, followed by my tailbone. They never let us see the tape, but in my dream last night I was at Houston High and the video was on display. In my dream I remember thinking what in the heck?! Next comes the ankle, I chipped my tibia not once but twice. Not only did we have cheer practice but we would also have conditioning classes and tumbling classes. 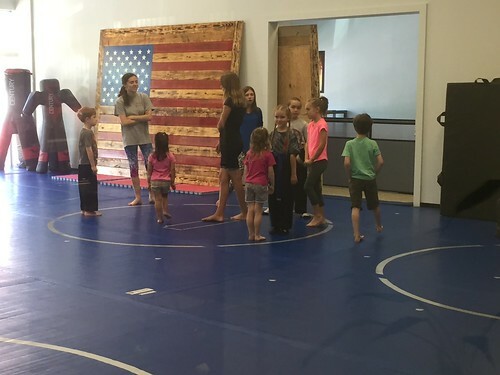 I loved the tumbling classes especially when we got to return to my old gym! I was working on a full twist and landed with my ankles together and feet pointed outward which is incredibly bad for ankles and knees. So began my ankle troubles. I was on the tumbling track working on a round-off, back-handspring, full twist, punch front. I landed the twist, felt the crack, and fell to the floor and immediately turned green. I chipped my tibia in my right ankle and was out for a very long time, even in a wheel chair, the pain was excruciating. About a year later, I was stunting, and we had switched around bases (bottom people) and I had never stunted with them before. You get really used to your partners and how you work together and everything just flows together well. I was trying a liberty heel stretch from the ground, got to the top and everything was wobbly, so I fell down, and same spot felt the crack. My principle carried me to the car that night! I was out again. As soon as I recovered from that one, I was back out and tumbling again. Unfortunately with cheer-leading, the tumbling was done on concrete. We had two long mats that we rolled up for practice, but that was for stunts during routines. We were going through a routine and I did my tumbling pass and landed hard on my right heel and fell to the ground. That was by far my most painful injury and still haunts me to the day. The x-ray showed 1 3/4″ fracture straight across my heel. I was done. Everyone knows Michael is a runner, so when they ask if I run, Michael usually says not really, she’s broken. I’ve started running more and more and have been working on issues with that. I have had a really bad shin splints for about two months now and after wearing a calf sleeve and changing up footwear, I haven’t noticed any foot/shin pain. I am researching trail shoes for hiking/backpacking in regards to my heel/foot pain…hoping to get that resolved before our next adventure. As far as the wrist, I have it taped today. Hoping that help with that. Michael said maybe you should just quit working out…I said, and then do what? I am the fittest I have been since “retiring” from cheer-leading. I can’t let these pesky old injuries tear me down now! I will just have to work around them! I dropped the kids off at school today and on the way home was thinking about that dream, and that stunt gone wrong. Cheer-leading is such a terrible sport for your bodies. One of my bases, in middle school, had a severe back injury. 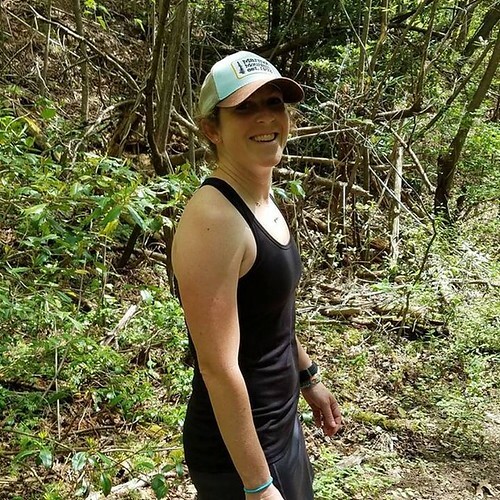 She wore a pack on her hip that would send some sort of pain medicine to block nerves in her back…all from holding, throwing, and catching people…in MIDDLE SCHOOL. I never encouraged my kids to try gymnastics or cheer. I want them to have their bodies, to not fight injuries, to not be broken when they are in their 30s. Michael is going to take EK trail running on Tuesdays when the time changes. She loves being on trails, mountains, and nature. So we are looking forward to seeing how that goes!